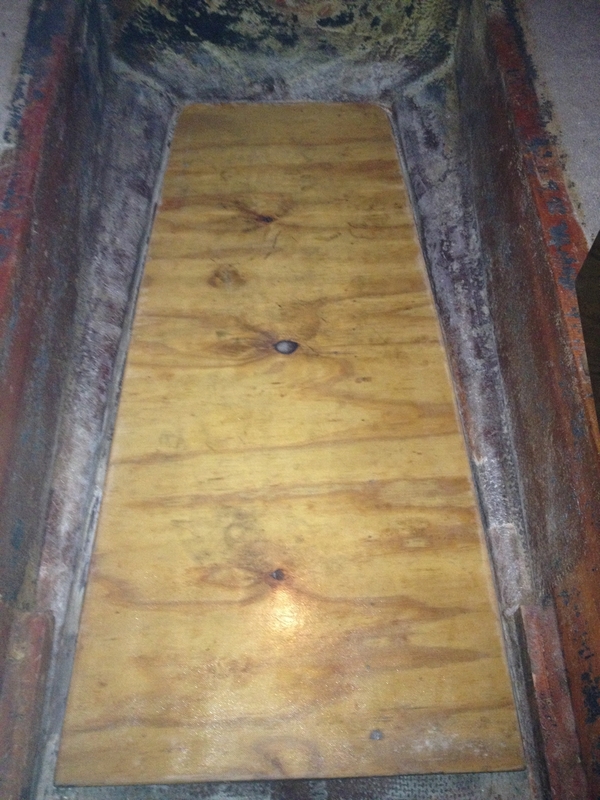 The amount of wood used in a production fiberglass boat is significant; it is used for many things such as stringers, bulkheads, floors, and backers. Higher quality production boats often use marine grade plywood for these applications but it can still be damaged by long-term exposure to water. My personal boat, Funktional, is a 1986 Formula 242 LS that had a cabin sole that became waterlogged and lost its stiffness. A limber hole that became plugged over 25 years ago finally resulted in an uneasy feeling when standing inside the cabin. When I purchased the boat 10 years ago the sponginess was barely noticeable, but after several more seasons the flexing became obvious. 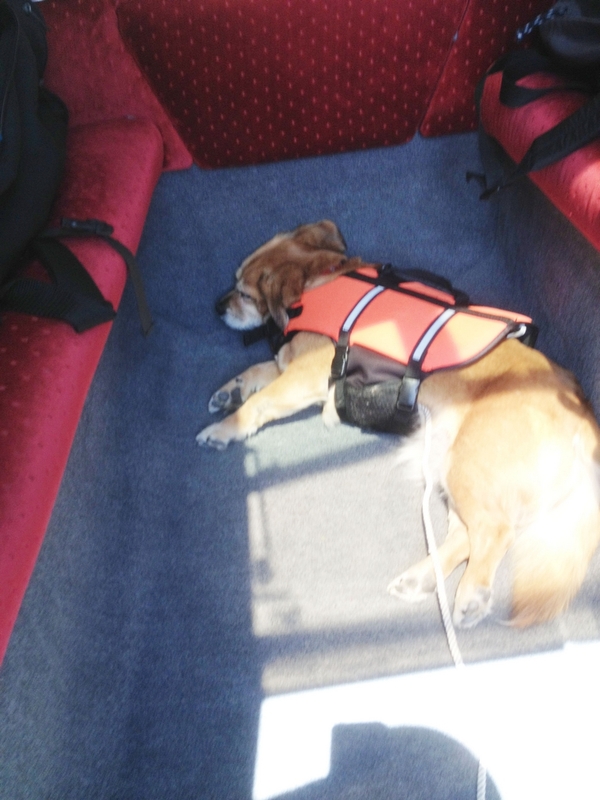 When my 24-pound dog jumped from the vee berth and the cabin sole deflected, it was clear the plywood had deteriorated. I decided that it needed to be repaired and took advantage of the Michigan winter to tackle the project. 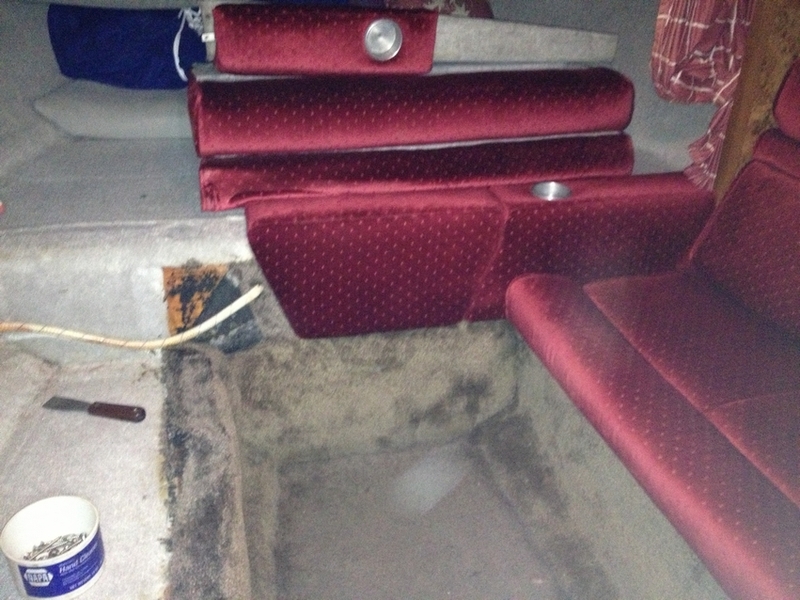 The first step was to disassemble the furniture in the cabin so that the carpet could be easily removed. It is important to realize that the closet and wet bar cabinets were installed in the boat before the deck was set in place and after the carpet was installed. This means these cabinets cannot be removed. I was able to loosen these assemblies enough to pull out the carpet from underneath the cabinetry. The cabin with the carpeting removed. With the carpet removed the actual cabin sole could be cut out. It was bonded in place with a layer of chopped strand mat that was applied over the top of the floor and up onto the hull bottom and stringers. A rotary cut off tool with an abrasive disc was used to cut off the tabbing, by keeping the guard close to the surface the amount of dust was minimized. I took care to ensure I was cutting into this chopped mat tabbing and not the hull; on some boats it may not be obvious and running the cut off tool into the hull bottom would create a lot of damage to repair. The cabin sole with a layer of chopped strand mat. 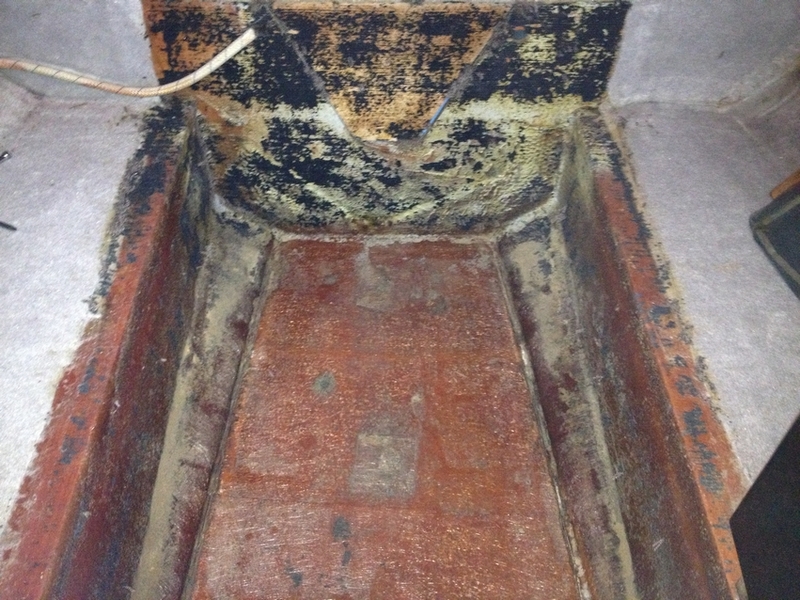 Aft floor support softened by water damage. To help locate the position of the new sole, a small lip of the chopped mat tabbing was left on the hull bottom and stringers. After the fiberglass was cut around the floor and I could remove the plywood from the cabin it became clear why it was spongy. 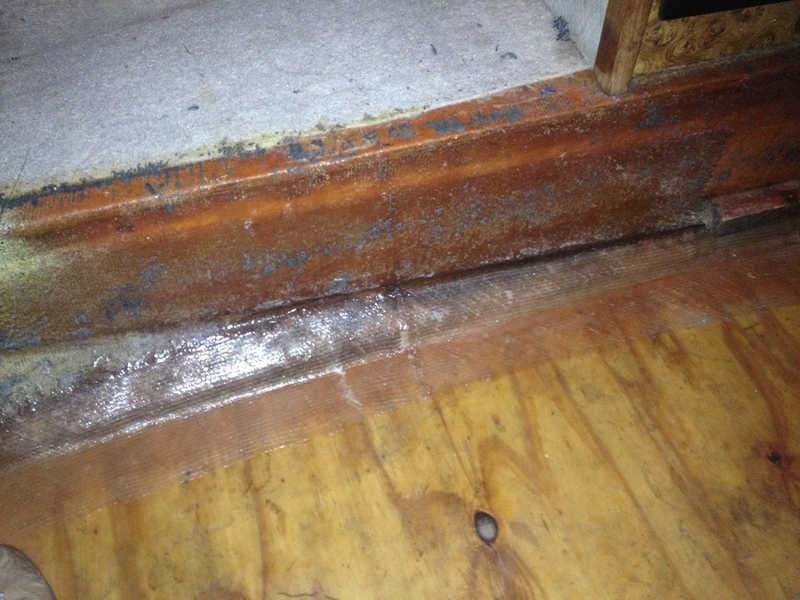 Not only was it waterlogged, it had a crack in it. The manufacturing defect that I mentioned earlier was also visible; a limber hole had been clogged with flotation foam. When the boat is on the trailer water can flow forward and this water did not have a good way to completely escape back to the bilge pump. New cabin sole with aft support frame. New cabin sole set in place. 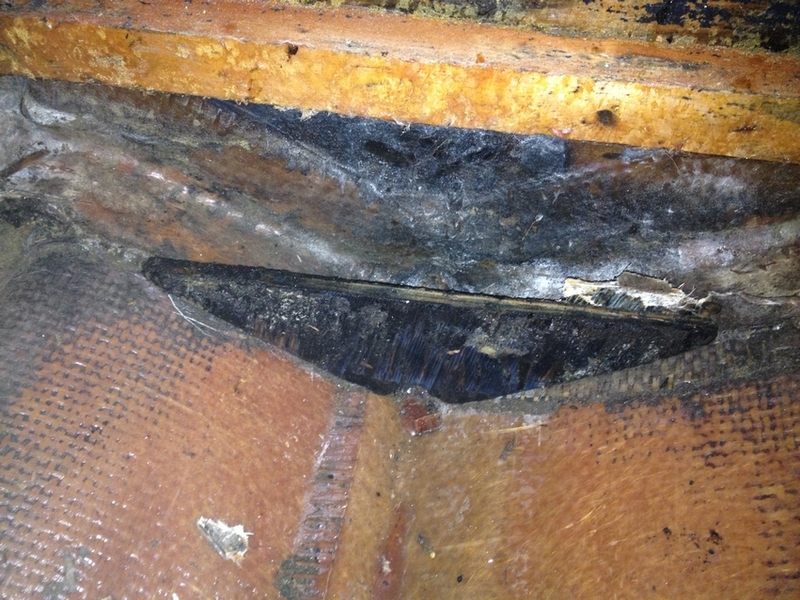 The fiberglass will hold the plywood in place and seal any gaps between the sole and the hull. 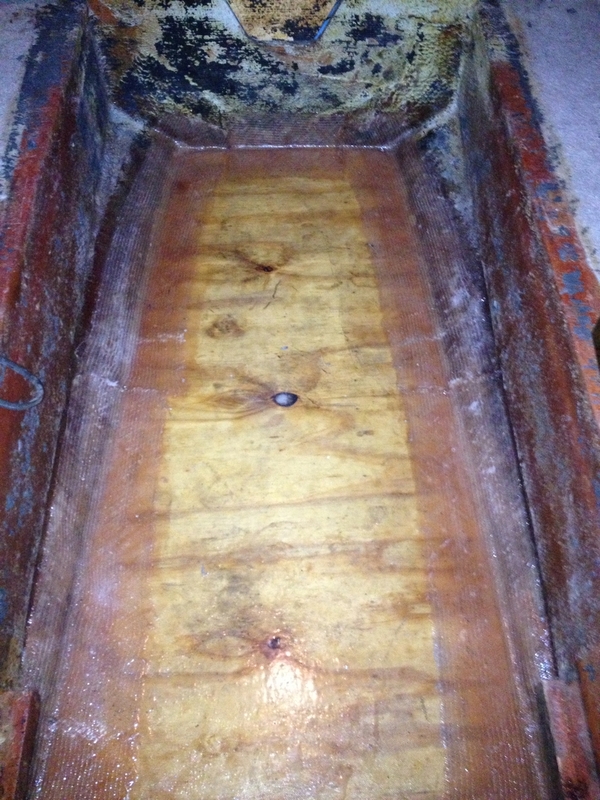 A small frame supported the aft section of the floor which was also soft and would be replaced with the new sole, but the cleats that supported the companionway step were in great shape other than the screw holes for the step were stripped. I swabbed these holes with epoxy to give the screws something to bite into. 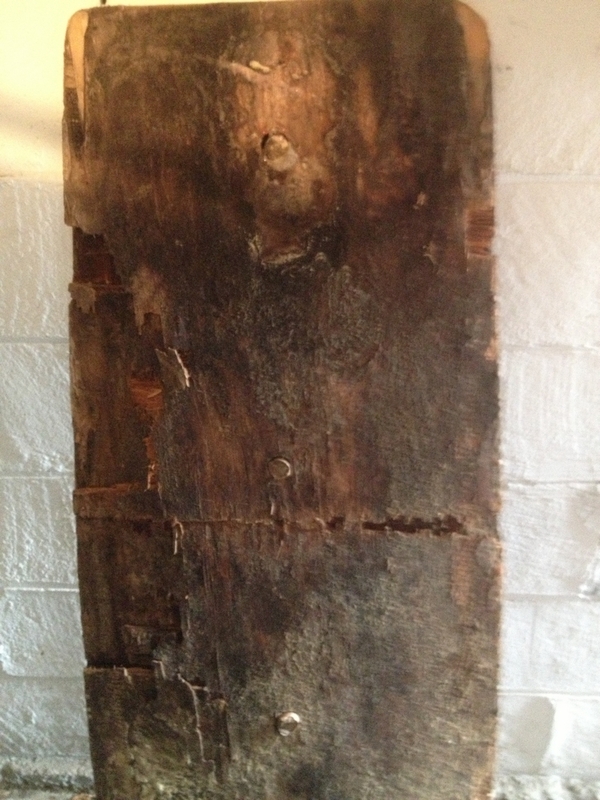 The original floor was ½” marine grade plywood, and considering the age of the boat and the amount of moisture it was exposed to it performed well for over 25 years. It was about 2′ wide and about 4′ long. 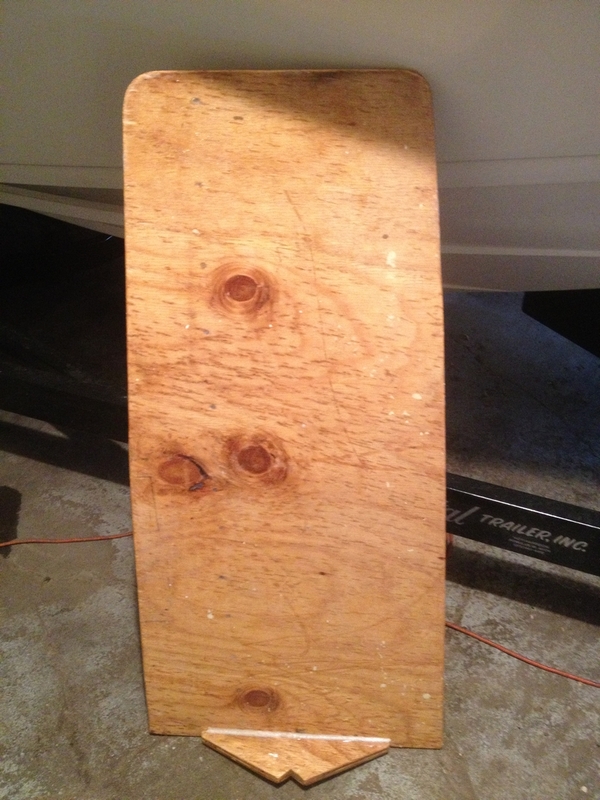 I did not have any ½” marine plywood and did not want to invest in a large sheet to only cut off 2 feet. This application is not critical to the strength of the hull, and now that the limber hole was unplugged it will stay much drier. I had an old sheet of ¾” AC exterior plywood and decided that by filling in the exposed knots, applying a light layer of WEST SYSTEM 4 oz. fiberglass on each side and thoroughly sealing the end grain around the perimeter it would be durable enough for this application. In addition, by shortening the length 2 inches I was able to orient the grain across the panel which will have increased strength because originally the grain ran lengthwise. Please keep in mind that marine plywood is superior for boat building and for certain structures would be considered required. The new sole was set in place using the outline of the old tabbing as a guide. A perfect fit was not needed because the new fiberglass tabbing bridged a small gap and the carpet covers the entire area. The sole rests on the hull bottom and the tabbing holds it down in place so there was no need to bond the plywood side to the hull bottom. Weights were placed on the sole to hold firmly against the hull while the tabbing cured. New cabin sole installed with WEST SYSTEM 737 17 oz. biaxial fiberglass on each side. The surfaces that the fiberglass would be bonded to were sanded by hand with 80-grit sandpaper, once again to keep dust to a minimum. I used WEST SYSTEM 737 fabric, the first piece I placed down was 4″ wide and then the second piece was 6″ wide. The biaxial fabric easily conformed to the needed shape and the differing widths reduced the chance of the edge being felt underneath the carpet. All of this work was done in a garage in Michigan in March. To ensure that the cold weather would not inhibit epoxy cure, I prepared the sole in my heated basement and used a small electric heater to warm the cabin when using the epoxy to tab in the sole. WEST SYSTEM 105 Resin with 205 Fast Hardener was the best choice for use in cool weather. Other advantages of using WEST SYSTEM Epoxy include low odor, excellent adhesion to the wood and existing hull laminate, and superior water resistance. After the epoxy had cured I wiped it down with water to remove any amine blush that may prevent the carpet adhesive from adhering and sanded any fiberglass strands that were poking up. 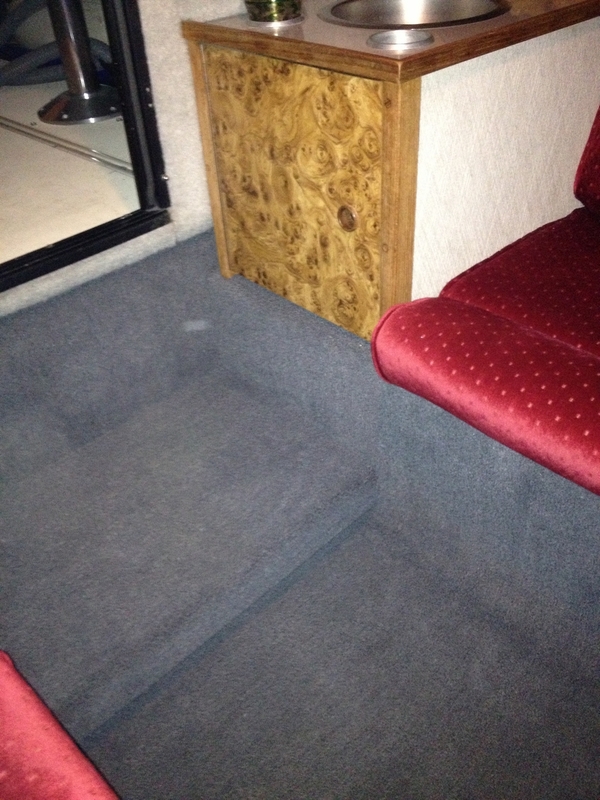 The finished sole repair with carpet installed. I found a plush marine carpet from Cabela’s and purchased outdoor carpet adhesive from my local big box store. The installation of the carpet was most difficult part of the project. The new carpet could not be installed underneath the cabinet and wet bar so I had to closely trim the carpet with razor blades and a pair Swiss Army knife scissors. Seam sealer was used to prevent it from fraying. When I started the project I was most worried about spilling epoxy inside the boat. By using lots of plastic sheeting I am happy to say not a drop got onto any upholstery or gelcoat. Unfortunately, the carpet installation did not go as well. The carpet has to fit around several corners and there was really nowhere to stand as I put it in place onto the sole so things got a little messy. It all worked out in the end, I am sure many people are more intimidated by the fiberglass portion of this repair but I found the carpet was actually the biggest challenge. The repair has made the cabin feel much more secure when stepping down from the cockpit, and new carpet really makes a very comfortable berth for the crew. The crew approves of the new repair job. 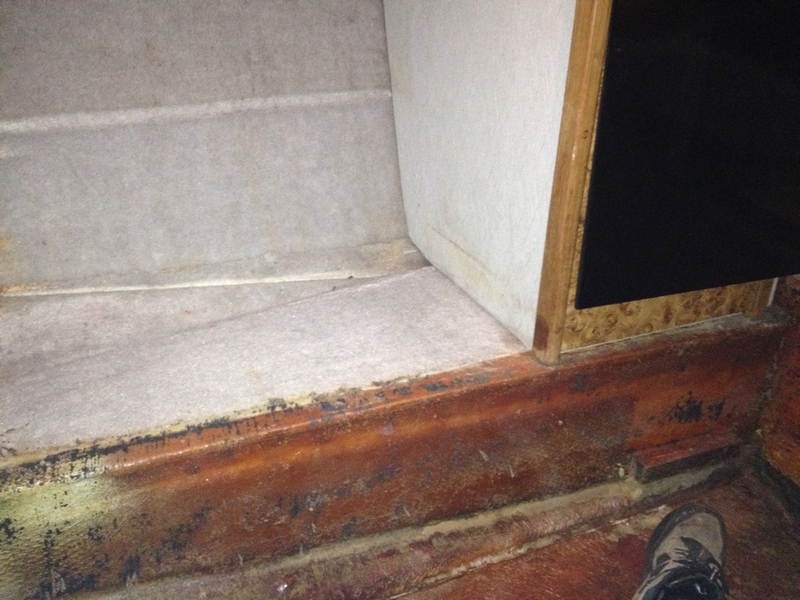 This entry was posted in Boat Repair, Fiberglass Boat Repair and tagged 37, cabin sole, Chamfer, Epoxyworks #37, Fall 2013, Fiberglass, Formula 242 LS, Funktional, Jeff Wright on July 18, 2015 by ewadmin.